Here’s an update on my exploration into how digital innovation may help support personal well-being, and services for ageing better. There’s nothing public yet from BIG’s Ageing Better programme, but impressive work in the Department for Communities and Local Government, and an interesting personal well-being app from Scotland. There’s no news yet about when Big Lottery Fund may launch the online community for its £82 million Ageing Better programme, which might have helped the 15 partnerships who are working hard to prepare their business plans to share experience – now they aren’t in competition. These plans have to be in before Christmas, and there’s then three months review within BIG before the partnerships each get £2.6 – £6 million over the next five years … or not. There’s been substantial support from consultants Hall Aitken to complement the in-house expertise of partnerships, so hopefully all will be well. The online community, when launched, may also be a way to help introduce some digital innovation to the programme, which I and others have argued is important but was lacking at the start. That topic will be the subject of a symposium – “Transforming not Excluding, the impact of information technology and innovation on later life” – organised in January by the South East England Forum on Ageing. It will be hosted by Lord Filkin, who is chair of BIG’s £50 million Centre for Ageing Better, so there may be scope for some joining up there. 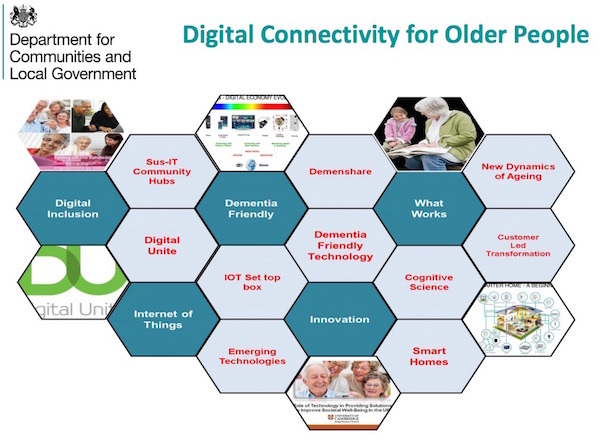 It seems to me the most useful current policy exercise to explore the benefits of digital inclusion and innovation for older people is the Grey Cells initiative being run by William Barker and his team within the Department for Communities and Local Government. 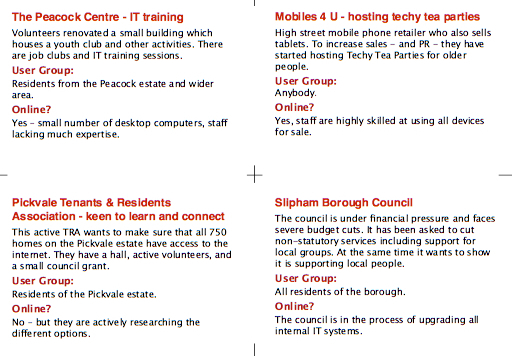 There’s already a really impressive database of local case studies and good practice, a resource pack, as well as results from a number of events. I understand wider engagement will follow in the New Year. Meanwhile I’ve been hosting some online discussion with the Age Action Alliance Digital Inclusion Group. No firm conclusions yet, apart from confirmation that there may be a lot going on, but it is difficult to find out or keep track … which makes the Grey Cells initiative all the more important. 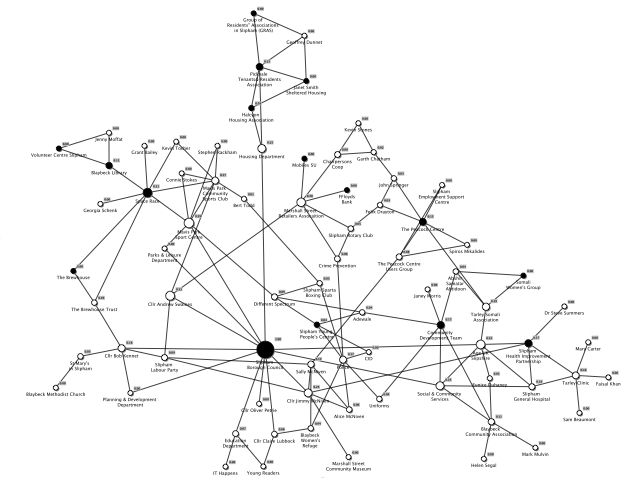 We hope to pilot some mapping of who knows who, using Drew Mackie’s expertise, in order to see how social network analysis could help. The always-interesting NESTA newsletter took me to their latest film on understanding Digital Social Innovation and Jamie Whyte’s report of a recent event on the topic. No explicit mention of digital for ageing better there – but what looks like very interesting discussion on creating digital social organisations, and the right infrastructure for digital social. I wonder how it might tie back to NESTA’s Living map of ageing innovators developed last year, and their associated Five Hours a Day framework I wrote about here. There’s further NESTA blog posts here. A recurrent theme from people who have been around for a while, and are prepared to share their insights, is that there’s little understanding of who is doing what, a great deal of re-inventing and refunding, and much working in silos. That’s at the top level. The intermediate organisations are constantly competing for funding, which makes cooperation difficult. Relatively few people in policy and the field of ageing are familiar with the wide range of digital tools and systems for knowledge sharing that are around. Unless people have a personal enthusiasm and commitment to learn, it’s difficult to keep up. Office systems may block social media and even relatively simple communications tools. The default for communicating outside (and even inside) organisations remains email and attachments. 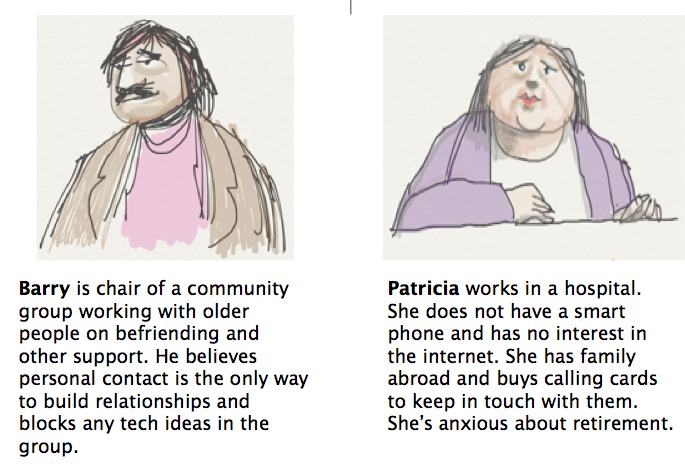 Meanwhile innovative consumer-level solutions are being developed to help older people connect with friends and family, and with care services – as shown in the useful round up by the Connecting Care team. The Financial Times reports on The Silver Economy: Tech sector taps surge of connected boomers . An industry has begun to emerge in providing devices and applications aimed at the wealthy boomer generation that has the time, money and superfast broadband connections to embrace the digital age. Ofcom, Britain’s communications regulator, found that older users are driving growth in the UK’s social networking, for example, with more than a third of people aged 55-64 using such websites compared with less than a quarter in 2011. There has been no significant growth among any other age group since 2011. Trying to make sense and connect up what’s happening in policy and intermediate organisations is very necessary … but pretty frustrating. There is not a culture of cooperation and digital literacy, so innovative thinking is not flourishing. On the other hand, older people are learning from the younger members of their family and each other. While policy makers may be saying “put older people at the heart of designing new programmes” and rather failing to do so, people are doing it for themselves. OK, there’s lots of people not connected, but personal consumer tech is where the energy is. Ginsberg is an online tool to help people improve their health and mental wellbeing. Users tell Ginsberg how they feel every day and record information about their sleep, exercise, nutrition, alcohol intake and other physical activities, as well as adding context about what has been going on in their lives. Ginsberg combines this emotional, physical and contextual data and provides users with smart, personalised and actionable insights. You can sign up on the web here. It is really easy to use, and connects with other apps and services. I’ll be chatting with Jodi to find out more about their approach. I’ve a hunch England can learn a lot from Scotland – as I always do from my Edinburgh-based colleague Drew. I can’t end without mentions for some free agents – whether inside or outside organisations – who innovate and share. Paul Webster is working with Miles Maier to share resources and advice on Connecting Communities, as I’ve mentioned. John is currently encapsulating his wide expertise into a Social Media for Social Good Advent Calendar, Shirley Ayres has added to her extensive work in the field with a provocation paper on the long term care revolution. Ken Clemens keeps up a stream of tweets about Ageing Better in Cheshire, and some insights on the programme. 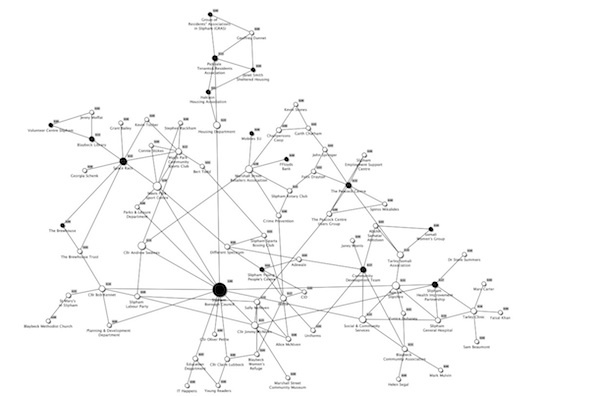 Apologies to others I haven’t mentioned this time … which leads me towards a route through all this complexity. When I was an old-time journalist, rather than an ageing social reporter, it wasn’t what you knew (or had in a filing cabinet or on a bookshelf) but who you knew. Want to find something out? Call your contact. Google and social media have made us lazy, and confused. Searches produce too much, and we are swamped by so many social media channels. The value of people like John, Shirley, Paul, many more, is not just that they share stuff, but they make sense along the way. Harold Jarche sums it up in in his Seek Sense Share framework, and advocacy of personal knowledge mastery. We all have to develop our digital literacies and networking behaviours to help nurture a cooperative social ecosystem, and value the community connectors (more here on ecosystems). Within that model, it doesn’t really matter too much whether or not Big Lottery Fund provides an online community platform. What’s important is to help people learn to share, work out loud, and connect with others. Which bring me back to some north of the border innovation, and the need to talk to Drew about our social network mapping. If you want to have a go yourself, the software to use is Kumu.io. BIG plans to host an #AgeingBetter online community. Open, closed, connected …? Here’s an update to my past posts about the Ageing Better programme, with news that the Big Lottery Fund will be providing some support for online sharing of stories and experience. It emerged from an event for partnerships in the programme. I don’t know if there was much discussion in the room, but the news sparked some sharp responses on Twitter. That’s where people are talking about the issues. Will the new space connect or not? Tags ageingbetter, biglotteryfund | Permalink | Comments Off on BIG plans to host an #AgeingBetter online community. Open, closed, connected …?